iPhone 4 Jailbroken Successfully, iPhone 4 Userland Jailbreak on Its Way!!! 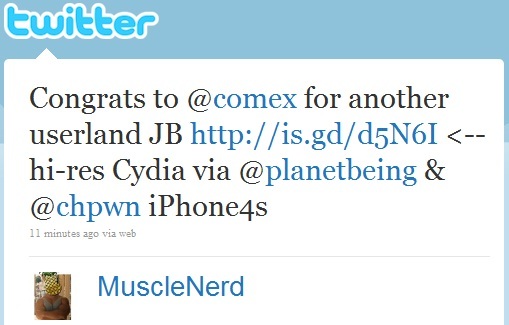 If you remember Comex the guy behind Spirit Jailbreak tool, a simple and fastest jailbreak for iPhone OS 3.1.3, he is once again back with userland jailbreak and this time it is for iPhone 4, flagship Apple phone released few days back. Yes, iPhone 4 has been successfully jailbreaked with the help of userland jailbreak. With the help of Comex code, Platebeing, Chpwn has managed to get root shell (SSH) on iPhone 4 and below is the screenshot showing Cydia running on iPhone 4. Well there isn’t any ETA for iPhone 4 userland jailbreak release and with rumors of iOS 4.0.1 floating on the internet expect any jailbreak & unlock for iPhone 4 only after Apple releases iOS 4.0.1. 3 Responses to iPhone 4 Jailbroken Successfully, iPhone 4 Userland Jailbreak on Its Way!!! Next Entry: Germany Demands Apple "open its databases to German data protection authorities"